Charles Darwin, the man who wrote The Origin of Species, and made these Islands world renowned, wrote the following famous paragraph in 1845. The natural history of these islands is eminently curious, and well deserves attention. Most of the organic productions are aboriginal creations, found nowhere else; there is even a difference between the inhabitants of the different islands; yet all show a marked relationship with those of America, though separated from that continent by an open space of ocean, between 500 and 600 miles in width. The archipelago is a little world within itself, or rather a satellite attached to America, whence it has derived a few stray colonists, and has received the general character of its indigenous productions. Considering the small size of these islands, we feel the more astonished at the number of their aboriginal beings, and at their confined range. Seeing every height crowned with its crater, and the boundaries of most of the lava-streams still distinct, we are led to believe that within a period, geologically recent, the unbroken ocean was here spread out. Hence, both in space and in time, we seem to be brought somewhat near to that great fact—that mystery of mysteries—the first appearance of new beings on this earth. In 1859 Darwin wrote The Origin of Species. 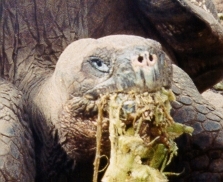 In 1959 The Galapagos were declared A National Park by the Ecuadorian government. In 1979 The Galapagos Islands were declared a World Heritage Site by UNESCO. This group of islands is well preserved by the Galapagos National Park Service. Be sure to get your copy of the rules and regulations and follow them. If you don't agree with any of the rules, or don't have the time or can't afford to travel to these "Islas Encantadas," but want to learn more about the Galapagos and its indigenous species, we recommend GALAPAGOS: A Natural History by Michael H. Jackson, published by the University of Calgary Press. This book is a must read. You may also want to check out a recently made 3D film called GALAPAGOS (see side bar) narrated and starring Dr. Carole Baldwin. This film was made by the Smithsonian Institution, IMAX Ltd. and the National Science Foundation. It is fantastic! Erica also recommends that you pick up a copy of “A Traveler’s Guide to the Galapagos Islands”, by Barry Boyce. You can find this book at major book stores.